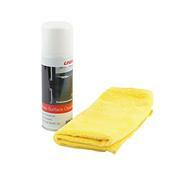 Gloss Surface Cleaner produces a smear free finish on gloss cupboard doors, glass, mirrors and chrome surfaces. Specially designed to remove dust, light dirt and water marks, cleans and polishes in one easy application. Professional grade cleaner that reduces the rate of static pick up on any surface and so reduce the dust build up.